In a new study, a University of Iowa-led research team reports it has identified a brain marker associated with aggression in toddlers. 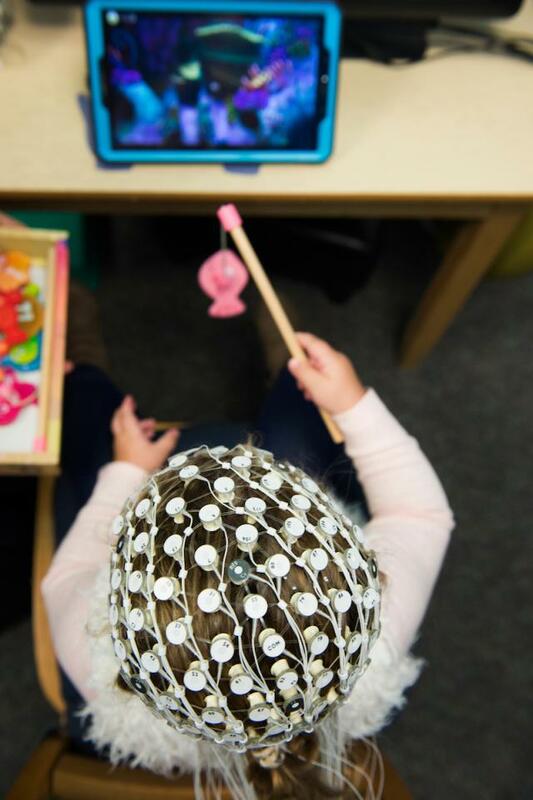 In experiments measuring a type of brain wave in 2½ to 3½-year-old children, toddlers who had smaller spikes in the P3 brain wave when confronted with a situational change were more aggressive than children registering larger P3 brain-wave peaks, research showed. "There are all kinds of ambiguous social cues in our environment," says Isaac Petersen, assistant professor in the Department of Psychological and Brain Sciences at the UI and corresponding author on the study. "And, when children aren't able to detect a change in social cues, they may be more likely to misinterpret that social cue as hostile rather than playful. "Children respond to the same social cues in different ways, and we think it's due to differences in how they interpret that cue, be it neutral or hostile," Petersen says. The P3 wave is part of a series of brain waves generated when an individual evaluates and responds to a change in the environment–such as changed cues in a social interaction. Previous research, primarily in adults, has shown individuals with shorter P3-wave peaks when confronted with a change in the environment tend to be more aggressive. As such, scientists believe P3 is a key indicator of aggression, as well as associated with depression and schizophrenia. The change in pitch is analogous to a change in a social interaction, in which the brain–consciously or subconsciously–reacts to a change in the environment. In this case, it was the change in pitch. The difference in P3 peaks in aggressive and non-aggressive children "was statistically significant," Petersen says, and the effect was the same for boys and girls. "Their brains are less successful at detecting changes in the environment," Petersen says of the children with shorter P3 brain-wave peaks. "And, because they're less able to detect change in the environment, they may be more likely to misinterpret ambiguous social information as hostile, leading them to react aggressively. This is our hypothesis, but it's important to note there are other possibilities that may explain aggression that future research should examine." "This brain marker has not been widely studied in children and never studied in early childhood in relation to aggression," says Petersen, who has an appointment in the Iowa Neuroscience Institute. "It might be one of a host of tools that can be used in the future to detect aggression risk that might not show up on a behavioral screening." "Evidence suggests that early interventions and preventive approaches are more effective for reducing aggression than interventions that target aggression later in childhood or in adolescence when the behavior is more ingrained and stable," he says. The paper was published Sept. 26 in the Journal of Child Psychology and Psychiatry. It is titled "A longitudinal, within-person investigation of the association between the P3 ERP component and externalizing behavior problems in young children." The children were tested at Indiana University-Bloomington. Contributing authors at Indiana University include Caroline Hoyniak and John Bates. Angela Staples at Eastern Michigan University and Dennis Molfese at the University of Nebraska-Lincoln also are contributing authors.